Wow things have been quiet on toepoke for the last few months. We haven't pushed a new build out to you guys and gals since last August! Rest assured that we've still been beavering away at our goal to create the best website for organising football with your friends. So what's been released this time? From the outset we've always concentrated on regular games. We think this is the biggest challenge and barrier to playing football with your mates. And without wishing to blow our own trumpet, we reckon we've got is sussed! From today you can create an occasional game too. Playing in a tournament? Or maybe just a curry night with your players? When adding a game there's now an occasional option. I know what you're thinking ... That's all well and good, but I've got to go through my squad and invite them all! What a faff! On the invitation screen there's a squad picker button which lets you pick another squad to find players. In order to protect the privacy of our users, you must be a manager of both squads to use the picker. You may notice you can also add a note to an invitation, so you can tell them a little about your game or social event. You've always being able to see who's in your squad (as a manager at least), but now we've added a little more help. On the my squad screen we've added an export facility. 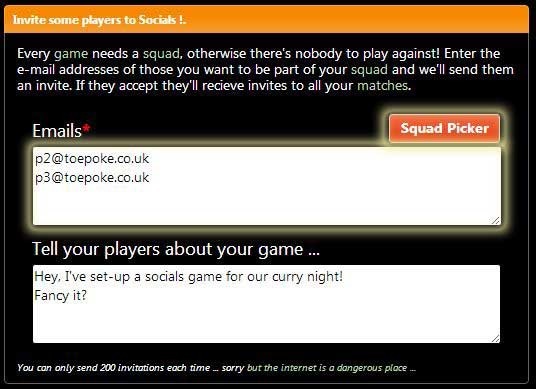 So if you decide toepoke.co.uk isn't for you - why, we can't comprehend you can export your squad and use another service. You can also use the export facility to e-mail all your squad members. As we've added more features to the site, more and more icons have appeared on the screens, which can make things a little confusing. To counter this we've split the icons between the ones we think you'll use most often to the left (e.g. setting the sides, inviting players, etc). The less used facilities have been moved to the right (e.g. changing pitch, reminders, etc). If you don't think we've broken things up correctly, please tell us. Players can now see matches that have been cancelled. Fix for disappearing password textbox when deleting a game. Fix for locked accounts, that were being locked for too long (after failing to login correctly multiple times). Fixed the menu icons on the squad screens, which had disappeared!!?! ?